1 A None No Power Seat 1 A is a Business Class Bulkhead seat with additional legroom. There are bassinets in this row, so passengers with infants are often seated here. There is no floor storage for this seat during take-off and landing. 1 B None No Power Seat 1 B is a Business Class Bulkhead seat with extra legroom. However, the close proximity to the lavatory and galley may be bothersome. There are bassinets in this row, so passengers with infants are often seated here. There is no floor storage for this seat during take-off and landing. 1 D None No Power Seat 1 D is a Business Class Bulkhead seat with extra legroom. However, the close proximity to the lavatory and galley may be bothersome. There are bassinets in this row, so passengers with infants are often seated here. There is no floor storage for this seat during take-off and landing. 1 E None No Power Seat 1 E is a Business Class Bulkhead seat with extra legroom. However, the close proximity to the lavatory and galley may be bothersome. There are bassinets in this row, so passengers with infants are often seated here. There is no floor storage for this seat during take-off and landing. 1 J None No Power Seat 1 J is a Business Class Bulkhead seat with extra legroom. However, the close proximity to the lavatory and galley may be bothersome. There are bassinets in this row, so passengers with infants are often seated here. There is no floor storage for this seat during take-off and landing. 1 K None No Power Seat 1 K is a Business Class Bulkhead seat with additional legroom. There are bassinets in this row, so passengers with infants are often seated here. There is no floor storage for this seat during take-off and landing. 24 A None No Power Seat 24 A is an Economy Class seat that may not recline. The close proximity to the lavatories may be bothersome. 24 B None No Power Seat 24 B is an Economy Class seat that may not recline. The close proximity to the lavatories may be bothersome. 24 D None No Power Seat 24 D is an Economy Class seat that may not recline. The close proximity to the lavatories may be bothersome. 24 E None No Power Seat 24 E is an Economy Class seat that may not recline. The close proximity to the lavatories may be bothersome. 24 F None No Power Seat 24 F is an Economy Class seat that may not recline. The close proximity to the lavatories may be bothersome. 24 G None No Power Seat 24 G is an Economy Class seat that may not recline. The close proximity to the lavatories may be bothersome. 25 J None No Power Seat 25 J is an Economy Class seat that may not recline. The close proximity to the lavatories may be bothersome. 25 K None No Power Seat 25 K is an Economy Class seat that may not recline. The close proximity to the lavatories may be bothersome. 26 D None No Power Seat 26 D is an Economy Class Exit Row seat with extra legroom. However, the close proximity to the lavatories may be bothersome. There are bassinets in this row, so passengers with infants are often seated here. The tray table and personal TV are in the armrest, making the armrest immovable and slightly reducing seat width. There is no floor storage for this seat during take-off and landing. 26 E None No Power Seat 26 E is an Economy Class Exit Row seat with extra legroom. However, the close proximity to the lavatories may be bothersome. There are bassinets in this row, so passengers with infants are often seated here. The tray table and personal TV are in the armrest, making the armrest immovable and slightly reducing seat width. There is no floor storage for this seat during take-off and landing. 26 F None No Power Seat 26 F is an Economy Class Exit Row seat with extra legroom. However, the close proximity to the lavatories may be bothersome. There are bassinets in this row, so passengers with infants are often seated here. The tray table and personal TV are in the armrest, making the armrest immovable and slightly reducing seat width. There is no floor storage for this seat during take-off and landing. 26 G None No Power Seat 26 G is an Economy Class Exit Row seat with extra legroom. However, the close proximity to the lavatories may be bothersome. There are bassinets in this row, so passengers with infants are often seated here. The tray table and personal TV are in the armrest, making the armrest immovable and slightly reducing seat width. There is no floor storage for this seat during take-off and landing. 27 A None No Power Seat 27 A is an Economy Class Bulkhead seat with restricted legroom due to the position of the Bulkhead wall. The close proximity to the lavatories may be bothersome. The tray table and personal TV are in the armrest, making the armrest immovable and slightly reducing seat width. There is no floor storage for this seat during take-off and landing. 27 B None No Power Seat 27 B is an Economy Class Bulkhead seat with restricted legroom due to the position of the Bulkhead wall. The close proximity to the lavatories may be bothersome. The tray table and personal TV are in the armrest, making the armrest immovable and slightly reducing seat width. There is no floor storage for this seat during take-off and landing. 27 J None No Power Seat 27 J is an Economy Class Bulkhead seat with restricted legroom due to the position of the Bulkhead wall. The close proximity to the lavatories may be bothersome. The tray table and personal TV are in the armrest, making the armrest immovable and slightly reducing seat width. There is no floor storage for this seat during take-off and landing. 27 K None No Power Seat 27 K is an Economy Class Bulkhead seat with restricted legroom due to the position of the Bulkhead wall. The close proximity to the lavatories may be bothersome. The tray table and personal TV are in the armrest, making the armrest immovable and slightly reducing seat width. There is no floor storage for this seat during take-off and landing. 35 D None No Power Seat 35 D is an Economy Class seat that is often bumped into due to the awkward configuration change from 4 to 3 seats. 35 G None No Power Seat 35 G is an Economy Class seat that is often bumped into due to the awkward configuration change from 4 to 3 seats. 36 D None No Power Seat 36 D is an Economy Class seat that has restricted legroom due to the misalignment with the seats ahead. 36 F None No Power Seat 36 F is an Economy Class seat that has restricted legroom due to the misalignment with the seats ahead. 36 G None No Power Seat 36 G is an Economy Class seat that has restricted legroom due to the misalignment with the seats ahead. 39 A None No Power Seat 39 A is an Economy Class seat in the last row of the aircraft that may not recline. The close proximity to the lavatory and galleys may be bothersome. 39 B None No Power Seat 39 B is an Economy Class seat in the last row of the aircraft that may not recline. The close proximity to the lavatory and galleys may be bothersome. 39 D None No Power Seat 39 D is an Economy Class seat towards the back of the plane whose close proximity to the lavatory and galleys may be bothersome. 39 F None No Power Seat 39 F is an Economy Class seat towards the back of the plane whose close proximity to the lavatory and galleys may be bothersome. 39 G None No Power Seat 39 G is an Economy Class seat towards the back of the plane whose close proximity to the lavatory and galleys may be bothersome. 39 J None No Power Seat 39 J is an Economy Class seat in the last row of the aircraft that may not recline. The close proximity to the lavatory and galleys may be bothersome. 39 K None No Power Seat 39 K is an Economy Class seat in the last row of the aircraft that may not recline. The close proximity to the lavatory and galleys may be bothersome. 4 A None No Power Seat 4 A is a Business Class seat whose close proximity to the galley and lavatories may be bothersome. 4 B None No Power Seat 4 B is a Business Class seat whose close proximity to the galley and lavatories may be bothersome. 4 D None No Power Seat 4 D is a Business Class seat whose close proximity to the galley and lavatories may be bothersome. 4 E None No Power Seat 4 E is a Business Class seat whose close proximity to the galley and lavatories may be bothersome. 4 J None No Power Seat 4 J is a Business Class seat whose close proximity to the galley and lavatories may be bothersome. 4 K None No Power Seat 4 K is a Business Class seat whose close proximity to the galley and lavatories may be bothersome. 40 D None No Power Seat 40 D is an Economy Class seat in the last row of the aircraft that may not recline. The close proximity to the lavatory and galleys may be bothersome. 40 F None No Power Seat 40 F is an Economy Class seat in the last row of the aircraft that may not recline. The close proximity to the lavatory and galleys may be bothersome. 40 G None No Power Seat 40 G is an Economy Class seat in the last row of the aircraft that may not recline. The close proximity to the lavatory and galleys may be bothersome. 6 D None No Power Seat 6 D is an Economy Class Bulkhead seat with extra legroom due to the position of the Bulkhead wall. However, the close proximity to the lavatories and galley may be bothersome. There are bassinets in this row, so passengers with infants are often seated here. The tray table and personal TV are in the armrest, making the armrest immovable and slightly reducing seat width. There is no floor storage for this seat during take-off and landing. 6 E None No Power Seat 6 E is an Economy Class Bulkhead seat with extra legroom due to the position of the Bulkhead wall. However, the close proximity to the lavatories and galley may be bothersome. There are bassinets in this row, so passengers with infants are often seated here. The tray table and personal TV are in the armrest, making the armrest immovable and slightly reducing seat width. There is no floor storage for this seat during take-off and landing. 6 F None No Power Seat 6 F is an Economy Class Bulkhead seat with extra legroom due to the position of the Bulkhead wall. However, the close proximity to the lavatories and galley may be bothersome. There are bassinets in this row, so passengers with infants are often seated here. The tray table and personal TV are in the armrest, making the armrest immovable and slightly reducing seat width. There is no floor storage for this seat during take-off and landing. 6 G None No Power Seat 6 G is an Economy Class Bulkhead seat with extra legroom due to the position of the Bulkhead wall. However, the close proximity to the lavatories and galley may be bothersome. There are bassinets in this row, so passengers with infants are often seated here. The tray table and personal TV are in the armrest, making the armrest immovable and slightly reducing seat width. There is no floor storage for this seat during take-off and landing. 7 A None No Power Seat 7 A is an Economy Class Bulkhead seat with extra legroom due to the position of the Bulkhead wall. The close proximity to the lavatories and galley may be bothersome. The tray table and personal TV are in the armrest, making the armrest immovable and slightly reducing seat width. There is no floor storage for this seat during take-off and landing. 7 B None No Power Seat 7 B is an Economy Class Bulkhead seat with extra legroom due to the position of the Bulkhead wall. The close proximity to the lavatories and galley may be bothersome. The tray table and personal TV are in the armrest, making the armrest immovable and slightly reducing seat width. There is no floor storage for this seat during take-off and landing. 7 J None No Power Seat 7 J is an Economy Class Bulkhead seat with extra legroom due to the position of the Bulkhead wall. The close proximity to the lavatories and galley may be bothersome. The tray table and personal TV are in the armrest, making the armrest immovable and slightly reducing seat width. There is no floor storage for this seat during take-off and landing. 7 K None No Power Seat 7 K is an Economy Class Bulkhead seat with extra legroom due to the position of the Bulkhead wall. The close proximity to the lavatories and galley may be bothersome. The tray table and personal TV are in the armrest, making the armrest immovable and slightly reducing seat width. There is no floor storage for this seat during take-off and landing. Business Class and Economy Class have personal TV screens featuring entertainment on demand with various audio options. Screens are 15.4 inches wide in Business Class and 10.6 inches wide in Economy Class. Business Class and Economy Class have personal TV screens featuring entertainment on demand with various movie and television program options. 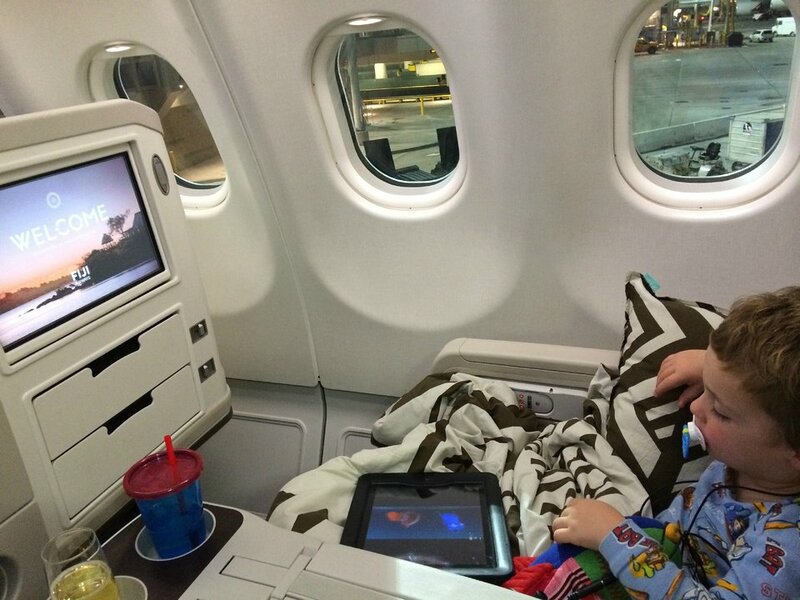 Screens are 15.4 inches wide in Business Class and 10.6 inches wide in Economy Class. AC power outlets are available in Business Class and USB ports are available in Economy Class. This Airbus A330-200 has 273 seats in a 2-class configuration. There are 12 seats in Business Class and 249 seats in Economy Class. This A332 flies from Fiji to Australia, New Zealand, China, and the United States. this seating for a long flight is not comfortable for anyone 160cm or more. Pick a window if you have to fly in anything economy or not green. Aisle seats are constantly getting hit with carts and people.. Entertainment system is great though with each seat it's own screen and sound. There is power available in each row per two seats. Appears to be adaptable for various power outletes. Flights were LAX to NADI and return. There was no overhead vent at all for temperature control. The seat was hard and very claustrophobic if the individual in front of you reclined. We fly about 2 long haul trips per year (for us we define long as at least on leg of the flight being 10+ hours) and these are by far the worst seats we have ever sat in. Food was okay but beverage service was very lacking. I flew from Los Angeles to Nadi and back on this aircraft. To date, the longest two flights I have ever been on, clocking in at 10.5 to 11 hours. The flight went by fast, the middle was tolerable on the way out (group flight ticket) and the window was great on the return. Sit on the right when flying NAN-LAX and you'll see the sunrise over the Pacific. Food was a lot better on the return to LAX, blankets were great, service was good. I would compare Fiji Airways to Hawaiian Airlines. Not a bad choice if you are going to the South Pacific. 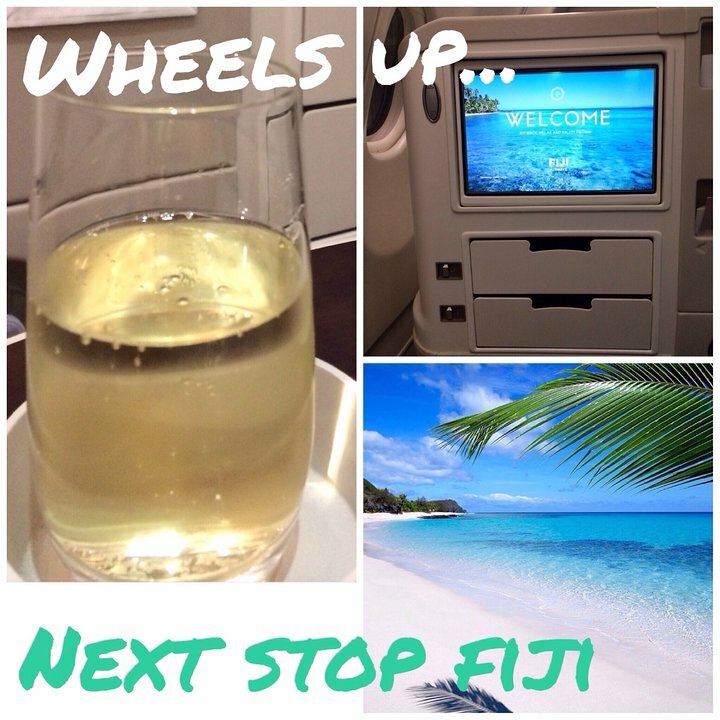 We were pleasantly surprised by the cabin and service on our flight from LAX to Nadi. The Seats were very comfortable, and we found the myriad of adjustments meant it was possible to tweak it until you found the most comfortable position. The front row is a double edged sword. On the one hand you have an incredible amount of space, however, it can be annoying with people walking past to the toilet. The food was excellent, and we will definitely travel with Fiji again. The extra legroom is fine and worth the premium price. Width is good as well. Having 4 lavatories around makes this area very crowded and people will try to cross the seats to reach other aisle's lavatories instead of walking by the galleys, this means on a night flight that you will be hit on feet and legs by anyone trying to cross the aisles in a quite dark plane, this is really bothersome. On my flight HK to NAdi during night time I was not able to sleep at all. Would suggest A/B/J/K seats for the extra price, the bulkhead is not close and there is plenty of extra legroom, except B/J at takeoff/landing will sit in front of crew member. Worst business class seat ever. My wife and I had 2J and K. The seats slide forward and your feet end up under the seat in front and not in a full recline. Not only was it claustrophobic it was uncomfortable. I couldn't sleep at all. The seats seemed very narrow too. I have had better seats in Economy Plus on Lufthansa. The three prong audio prevented me from using either of my noise cancelling headphones. The headphones provided are terrible and hurt after an hour. On the upside, the flight attendants are some of the best I've had in the forward cabin. One commenter suggested sticking to Qantas. I agree. My review is of the business class seats: 2D & 2E located in the second row of business class, in the middle section. 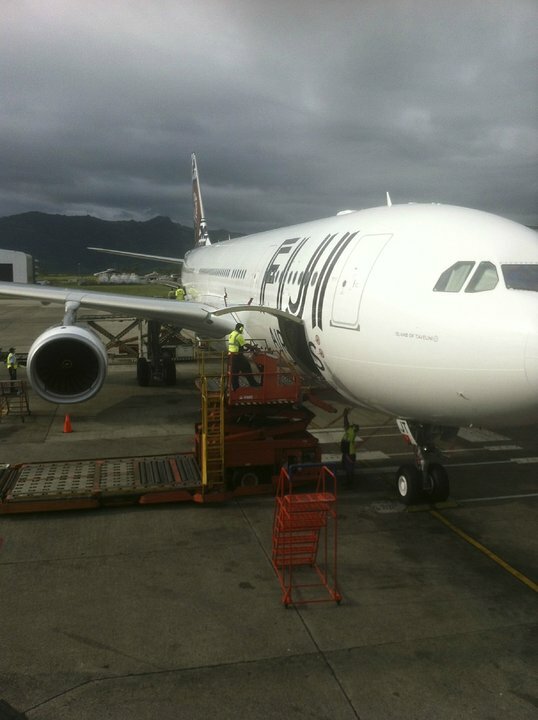 We flew to Nadi, Fiji from Los Angeles, CA on 12 Jan 2016, and returned on 21 Jan 2016. These seats were very comfortable. They reclined nearly flat. My husband is 6' 3 1/2" and was very comfortable and roomy. The seats have a back panel that is stationary. This is really nice as the seat will adjust fully into all positions without impeding on the passenger behind it. The seat adjustments are in the armrest, and you are able to adjust every part and angle of the seat. There were 13 different buttons for adjustment. And, don't forget that there is also a fold down foot rest. This really is nice when you recline the seat into the bed position, allowing you to push yourself up. There are nice comforters for sleeping, and a small rectangular and firm pillow. My only complaint is that the center armrest/console juts out in front, making it difficult to get by. It is nice to have the extra room on the armrest whilst seated, but, passing by is not so great. No big deal really. Although I travel with Bose noise canceling earbuds, the headsets provided are the type that cover your ears completely. There are 2 nooks under each arm rest to stow items, 2 in the front edge of the center console, and 2 storage compartments directly in front of your seat to stow your shoes. A lot of people put other items in the compartments. But, it works perfectly to place your shoes into and out of the way. There is a small adjustable light in the side of the headrest and one overhead light. We were provided a small zippered bag with a toothbrush, Colgate toothpaste, a pair of long fuzzy socks, foam ear plugs, and a cloth eye mask. A nice touch. I plan on using the bag for cosmetics while traveling again. The food from LAX was good. But, the food from Nadi was bland and rubbery. Not sure why such a big difference. Over all, these seats were better than any 1st class seats we've flown on Delta (which is our usual airline). seats are too close together.at least the sound system works(unlike the old leased 747's). last trip I wish I would have had 'blocks' to prevent the man ahead of me from practically being in my lap. He had the seat reclined all the way Lax to Nadi. it's not my fault he and his wife had 3 kids and the baby cried nearly all the way from Lax TO Nadi. I had to climb over the arm rest so the lady next to me could get out to go use the toilet. As a senior citizen and breast cancer survivor with lymphedema it was very hard on me to climb over the arm rest. I had asked for bulkhead aisle set due to my handicap, but the seats across the aisle from him were given to the last 2 people on the plane(who were on standby). I was really satisfied with the flight. Great food, great service, great entertainment, great seat (pretty much a flat bed). However at Sydney Airport when I was checking in I asked for a window seat. They told me that there were none left, although once everyone boarded the plane, I could clearly see that there were at least 5 window seats vacant. This also happened on my return flight from Nadi to Sydney. So everyone, I suggest that you book your seats online the day before, or call the airline. Also the business lounge at Nadi Airport isn't exactly the best airport lounge you will come across. Cabin temperatures vary widely from uncomfortably cold to warm. Excit row seats near the fuelage are very very cold - all the time. I have flown this route for years and these are the tightest most uncomfortable and seats imaginable. If anyone leans their seat back in front of you, and they will do that on a 10+ hr flight, you can't get out of your seat. I long for the B747SP - old, faster, noisier, more comfortable even in a saggy seat. That goes for business class and economy. 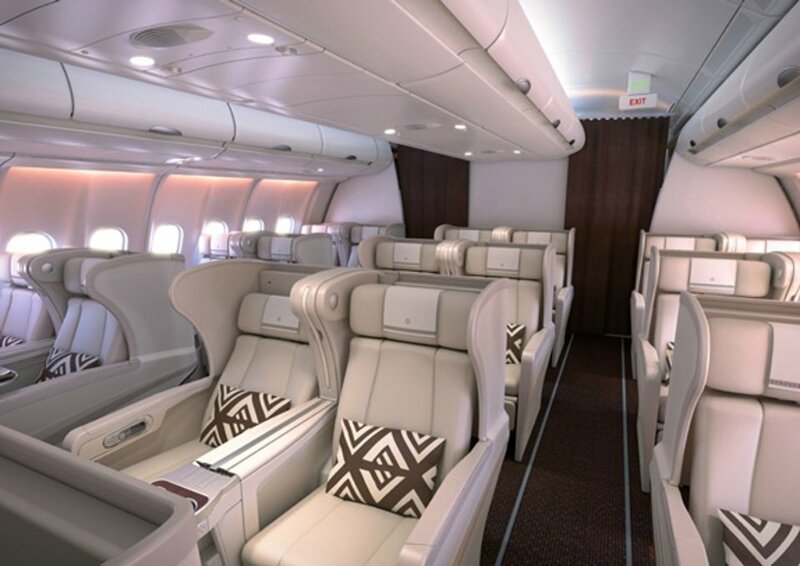 The Business Class seats don't recline to 180 degrees. The foot of the "bed" is considerably lower than the head even when fully "flat." The good news is that the flight attendants - like everyone in Fiji - are very friendly and helpful. 10 hour flight from Fiji to LAX. Snack & Breakfast. Pros - although over the wing, still able to see view of city lights etc, adequate leg room. Cons - not much room when seat in front reclines, bit of noise from the engine all throughout (if you're ok with white noise, it shouldn't bother you). 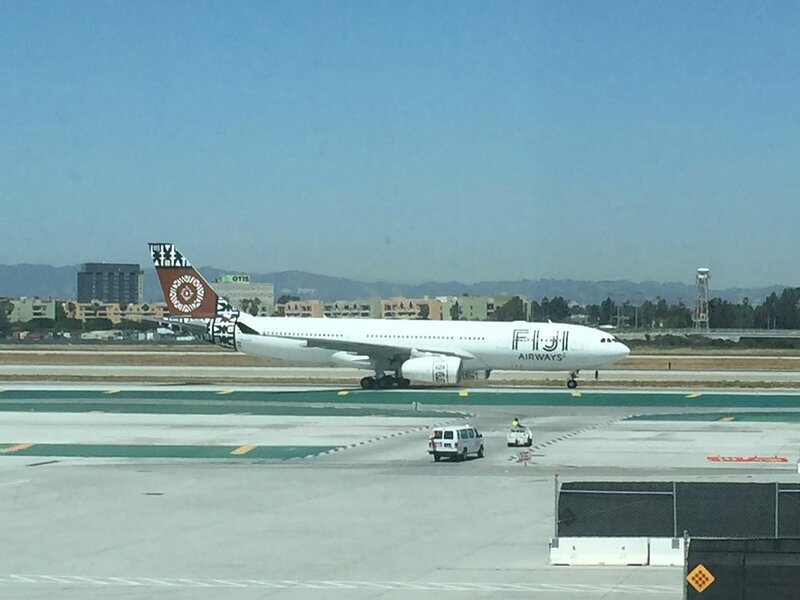 Fiji Airways flies 1 versions of Airbus A330-200.